(1) In the case of rigid plastic global analysis, a joint at a plastic hinge location should have sufficient rotation capacity. (2) The rotation capacity of a bolted or welded joint should be determined using the provisions given in 6.4.2 or 6.4.3. The design methods given in these clauses are only valid for S235, S275 and S355 steel grades and for joints in which the axial force NEd in the connected member does not exceed 5% of the design plastic resistance Np( Rd of its cross-section. (3) As an alternative to 6.4.2 and 6.4.3 the rotation capacity of a joint need not be checked provided that the design moment resistance Hj,Rd of the joint is at least 1.2 times the design plastic moment resistance HplRd of the connected member. (4) In cases not covered by 6.4.2 and 6.4.3 the rotation capacity may be determined by testing in accordance with EN 1990, Annex D. Alternatively, appropriate calculation models may be used, provided that they are based on the results of tests in accordance with EN1990. (1) A beam-to-column joint in which the design moment resistance of the joint Hj,Rd is governed by the design resistance of the column web panel in shear, may be assumed to have adequate rotation capacity for plastic global analysis, provided that dltw < 69s. - the beam end-plate or tension flange cleat in bending. (3) A joint with a bolted connection in which the design moment resistance Mj,Rd is governed by the design resistance of its bolts in shear, should not be assumed to have sufficient rotation capacity for plastic global analysis. Ub is the depth of the beam; Uc is the depth of the column. 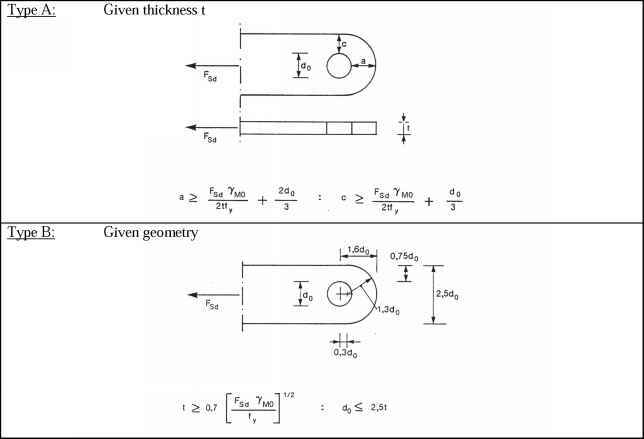 (2) An unstiffened welded beam-to-column joint designed in conformity with the provisions of this section, may be assumed to have a rotation capacity ^Cd of at least 0,015 radians. fy is the yield strength of the relevant basic component. (1) This section gives detailed application rules to determine the static design resistances of uniplanar and multiplanar joints in lattice structures composed of circular, square or rectangular hollow sections, and of uniplanar joints in lattice structures composed of combinations of hollow sections with open sections. (2) The static design resistances of the joints are expressed in terms of maximum design axial and/or moment resistances for the brace members. (3) These application rules are valid both for hot finished hollow sections to EN 10210 and for cold formed hollow sections to EN 10219, if the dimensions of the structural hollow sections fulfil the requirements of this section. (4) For hot finished hollow sections and cold formed hollow sections the nominal yield strength of the end product should not exceed 460 N/mm2. For end products with a nominal yield strength higher than 355 N/mm2 , the static design resistances given in this section should be reduced by a factor 0,9. (5) The nominal wall thickness of hollow sections should not be less than 2,5 mm. (6) The nominal wall thickness of a hollow section chord should not be greater than 25 mm unless special measures have been taken to ensure that the through thickness properties of the material will be adequate. (7) For fatigue assessment see EN 1993-1-9. 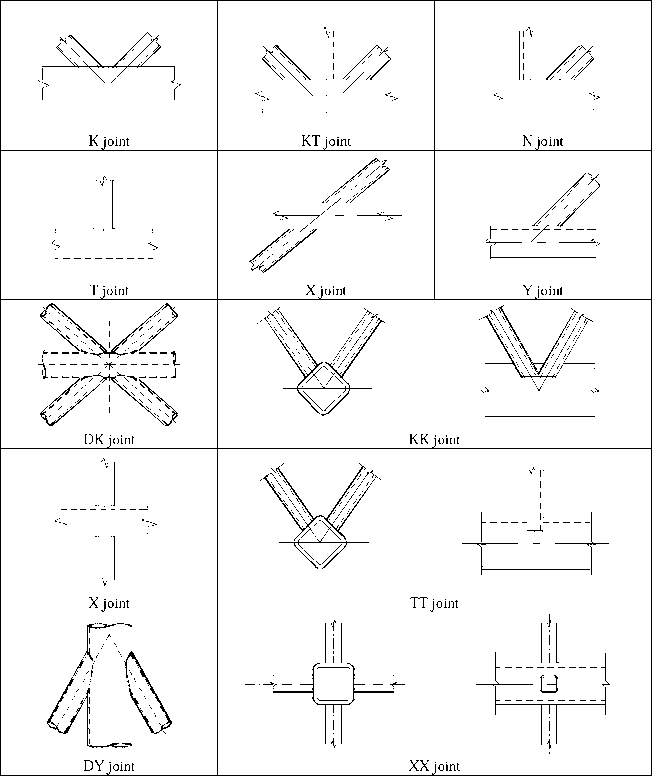 (8) The types of joints covered are indicated in Figure 7.1. (1) The application rules for hollow section joints may be used only where all of the conditions given in 7.1.2(2) to 7.1.2(8) are satisfied. (2) The compression elements of the members should satisfy the requirements for Class 1 or Class 2 given in EN 1993-1-1 for the condition of pure bending. (4) The ends of members that meet at a joint should be prepared in such a way that their cross-sectional shape is not modified. Flattened end connections and cropped end connections are not covered in this section. (5) In gap type joints, in order to ensure that the clearance is adequate for forming satisfactory welds, the gap between the brace members should not be less than ( t1 + t2 ). (6) In overlap type joints, the overlap should be large enough to ensure that the interconnection of the brace members is sufficient for adequate shear transfer from one brace to the other. In any case the overlap should be at least 25%. (7) Where overlapping brace members have different thicknesses andIor different strength grades, the member with the lowest ii fyi value should overlap the other member. (8) Where overlapping brace members are of different widths, the narrower member should overlap the wider one. (1) The design values of the internal axial forces both in the brace members and in the chords at the ultimate limit state should not exceed the design resistances of the members determined from EN 1993-1-1. (2) The design values of the internal axial forces in the brace members at the ultimate limit state should also not exceed the design resistances of the joints given in 7.4, 7.5 or 7.6 as appropriate.